We left Shroud and headed north to find a more protected anchorage. The forecast was for light and variable winds except when the squalls come through. As we came in the entrance to Allens Cay, the waves were getting larger and it was starting to rain. The wind was also picking up as a squall approached. 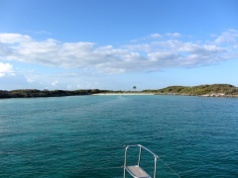 First we tried to go towards the north end of the cay where six sailboats were anchored. There wasn’t room for us so we went back out of that anchorage over to one on the southwest side. On the charts, there is room for just one boat in this anchorage and luckily we were it. 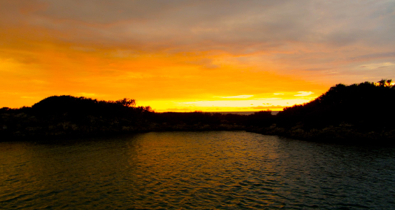 The area seemed wide, but when we dropped our anchor in the middle we could see that if we swung we would come close to either side, which in the photo above at sunset is rock. We settled in with not much to do here. There are a couple of small beaches populated by large iguanas. In fact, a fast bast came in the anchorage, probably from Nassau, to let some passengers go ashore and look at the beasts. In the photo at the left, the beach at the end of the anchorage was the one we would take Daisy for a walk on and we worried that there might be iguanas there. In the evening it was empty, although Mark kept Daisy on a leash. She did seem a bit nervous, sniffing around and looking at the foliage. For her morning walk, there was a very big iguana, about four feet long, sunny himself on the rocks. Daisy didn’t notice him and had her walk without being bothered as Mark kept her at the other end of the beach. We had an interesting diversion at 8:40 pm as we were sitting in the salon. It was dark outside and we saw a mast with its navigation lights on passing us farther into “our” anchorage. We quickly called the captain on the radio and informed him that there wasn’t room for another boat here and he was dropping his anchor on top of ours. He politely thanked us and said he had a rough crossing. We couldn’t figure out where he had crossed from because coming from Nassau the sail is easily completed in daylight. He moved several times around the area, actually dropping his anchor once right in the inlet. Eventually he tried several places on the outside of the cay and luckily there weren’t any squalls during the night. It is a huge mistake to be sailing in these waters in the dark because there is coral everywhere and certainly one doesn’t enter an anchorage in the dark. It was obvious this sailor did not know the area and he was very lucky he didn’t hit something.